Before to z/OS V1R13, RRSF only supported the APPC protocol. 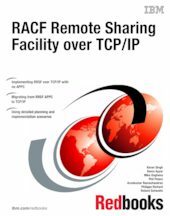 With z/OS release V1R13, TCP/IP can be used to extend the RACF Remote Sharing Facility (RRSF) functionality to a network of RRSF nodes capable of communicating over the TCP/IP protocol. Using TCP/IP connections for RRSF nodes provides advantages over APPC such as improved security, including stronger encryption levels. This IBM® Redbooks® publication addresses the issue of implementing a new RRSF network using the TCP/IP protocol. It covers planning, implementation, and operational issues for deploying RRSF using TCP/IP. In addition, It addresses migration of an RRSF network from APPC to TCP/IP, including in-depth examples of the migration process.